Georgia Sports Blog: Could Phil Steele Have Made a Mistake? Could Phil Steele Have Made a Mistake? According to Ralph Wiggum, that's "unpossible." But it may have happened. The Man of Steele had listed key accomplishments and other random stats over the past five years. In his list, he tracks most overall wins and most road/neutral wins since '03. He has UGA down at 24-8 away from Athens. I've got the Dawgs down for 9 losses during that time. Is he only counting regular season games? He counts bowl games in his total win category. Surely, he isn't wrong. There would be nothing left to believe in...if not the infallibility of The Statsed One. He's probably not counting the '07 UT loss since Neyland officially became UGA property on October 6, 2001. Wouldn't the SECCG be a neutral site game? Georgia was the home team for the '03 SECCG. Doubt not the power of Diet Mountain Dew, my son. What about all the G-Day games? Don't those count? Seriously, I can't wait until Saturday. Last April, when Knowshon took some carries, I was "oh my God, look at him." And the year before that, with Stafford's first pass for a touchdown. . .
I/we know what these returning starters can do. I can't wait to see what Caleb and Dontavius do. Heck, I'm actually more excited about place-kicking, and I'm pulling for Drew (Drew, if you do become place-kicker come fall, your Daddy better make damn sure you're wearing number 5). who's the goober dawg in the photo? Paul, is that you? LOL!! nope - it's Phil Steele. 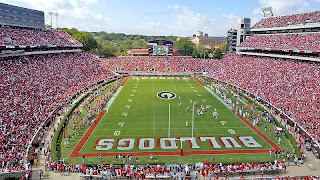 "Georgia was the home team for the '03 SECCG." Why? LSU had 1 conference loss; we had 2. I know they wore their away unis, but that's because they're just like that. There's no way in this universe that Phil Steele made a mistake. Either 1) our pea sized lizard brains are failing to comprehend the truth with clarity or 2) some underling at PS or the editor/publisher made a typo. But there is no way that PS made a mistake. UGA was the home team for the 2006 Cocktail Party. must have not counted that as away from Athens.